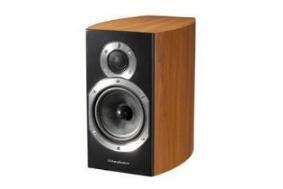 Wharfedale launches Diamond 10.1 budget speakers – and we'll have the world exclusive review | What Hi-Fi? The first speakers to emerge from the new Diamond 10 range, the 10.1 speaker claims stronger multi-layer MDF cabinet walls, a new look complete with composite panel front baffle and improved, 12.5cm mid/bass drive unit. Elsewhere the twin reflex ports have been moved to the rear of the cabinet, a diffuser has been added in front of the 2.5cm tweeter and even the way the grille attaches to the speaker has been adapted and in theory improved. Peter Comeau, Wharfedale's recently appointed director of acoustic design, has been responsible for voicing the Diamond 10 Series. Available from July, the Wharfedale Diamond 10.1 speakers will sell for £200 a pair, and you can read a world exclusive review in our September issue, out July 29th.